This chapter focuses on the connections between linguistic and nonlinguistic acts performed by members of communities which are primarily defined in geographical terms. It will become apparent that surprisingly often people from the same community make similar decisions from a variety of linguistically and nonlinguistically relevant options for action. The discussion begins with some early reflections within the scientific discourse which reveal concepts such as “border” or “language area” to be strongly influenced by the mental representation of speakers. As will be demonstrated, there is a close link between these mental representations and identity- or culture-based behavior. This behavior affects both the linguistic and the nonlinguistic dimension. On the one hand, this is illustrated by the scientific discourse in the German tradition, and, on the other, by two more recent examples which empirically analyze the connection of language and nonlinguistic behavior. The first example is dedicated to the connections between speech communities and political behavior in the USA. In contrast, the second example focuses on the connections between speech communities and economically relevant behavior in Germany. In both cases, there are statistically significant effects which indicate a strong interplay of language, communities, and action. In many nations, it is not very difficult to discern a speaker’s origin by his or her speech. Obviously, there are regional patterns of language and, what is more, these patterns have been considerably stable over long periods. This, in turn, is why language is a nearly perfect means for the expression of one’s social or cultural identity. Language stores strong indexical information (Silverstein 2003), which is formed by in-group behavior. Besides language, there are further means of social or cultural expressions, such as attitudes or stereotypes, which have been intensively studied in linguistics (e. g., Preston 1999; Long and Preston 2002). It is well known that there are also strong connections between linguistic variation and nonlinguistic behavior. These connections concern both influences on language by the environment and, vice-versa, influences by language on the social behavior of communicators (MacFarlane and Hay 2015). While studies in this field indicate the social impact of language within communicative practice, far less considered are the closer links between language, here with reference to regional varieties, the speech community, and action outside the communicative practice. What is behind, for example, strong correlations between the spatial borders of dialect regions and the spatial borders of marriage behavior (Lameli 2014)? Even though the interplay of linguistic and nonlinguistic phenomena is firmly anchored in the consciousness of researchers since the early days of dialectology and even more so since the emergence of sociolinguistics (Chambers and Trudgill 1998), there is only little known about it on the larger scale. This chapter, therefore, outlines in a more general sense some important interdependencies between linguistic and nonlinguistic acts performed by geographically defined members of speech communities. In what follows, I briefly discuss some early work dedicated to striking parallels between cultural phenomena and dialects, which will then be contrasted with more recent studies in the field. In so doing, the conceptual progress in dialectology as well as current developments in linguistics and the social sciences will be highlighted. This is undertaken with recourse to a model case, which is found in German dialectology. This line of tradition is especially suited for a more narrow discussion, as there is a rather long and eminent debate about significant parallels of language and nonlinguistic phenomena. In contrast to other nations such as France, Spain, or England, the German landscape was fragmented into very small territories without a centralistic pan-German authority until 1871. This is why in Germany, at least until the end of WWII, dialects, costumes, traditions, and other particularities of social life are fragmented on a very small scale. It will be shown that this historic fragmentation explains contemporary nonlinguistic acts to some extent, which is why it becomes possible to identify specific geographically relevant borders that affect both individual and social behavior. Against this background, the next section places the subject in a more general framework. Section “Sociocultural Discourses in German Dialectology” turns to the German tradition by dividing the existing sociocultural studies since the nineteenth century into two phases. The starting point is the more traditional focus on the linguistic area as the primary reference point of scientific discourse (Phase 1). This focus subsequently shifts to the members of the speech community as the actual subject of discourse (Phase 2). Building on this change of perspective, section “Empirical Insights into the Interplay of Language Areas, Speech Communities, and Nonlinguistic Phenomena” offers deeper insight into recent work on the connection between linguistic variation and extralinguistic – in this case political and economic – aspects of action. The presented studies allow a more integrative view on the embedding of regional varieties in the historically grown social environment of people. Finally, section “Concluding Remarks” offers concluding remarks. In his Theory of Social Action, Luckmann (1992, p. 4) takes a clear stance by writing: “Action […] makes society” (my translation). Consequently, definitions of social groups typically are based on communities of such individuals, which are united by common, that is, interindividually aligned or synchronized action. This applies also for speech communities, as the American philologist Bloomfield (1933, p. 42) has already noted. For Bloomfield, the speech community includes part of a more comprehensive cultural dimension, but, being based on an individual’s higher human cognitive capacity (speaking), it is the most important type of all social communities. Bloomfield, however, though seeing relations between speech communities and political, economic, or cultural groupings, assumes no actual coincidences: “Cultural features […] are almost always more widespread than any one language.” This is somewhat different than what the Romance philologist Coseriu (1974, p. 53) states. For him, “the systematic [i.e., what is related to the language system], the cultural, the social and the historical coincide” (my translation). Regarding, however, “the limits of the various systematic, cultural, social and historical structures” (Coseriu 1974, p. 53; my translation, emphasis in the original), that is, the concrete scope of these categories, it must be assumed that their coincidence is not a necessary condition of social communities. Boundaries are thus more likely to be relational rather than absolute; they are also more likely to be vague rather than concrete (see also Allen et al. 1998, p. ix). An example for such historically grown relationships is provided by Maurer in the framework of the culture-oriented dialectology of the early twentieth century. 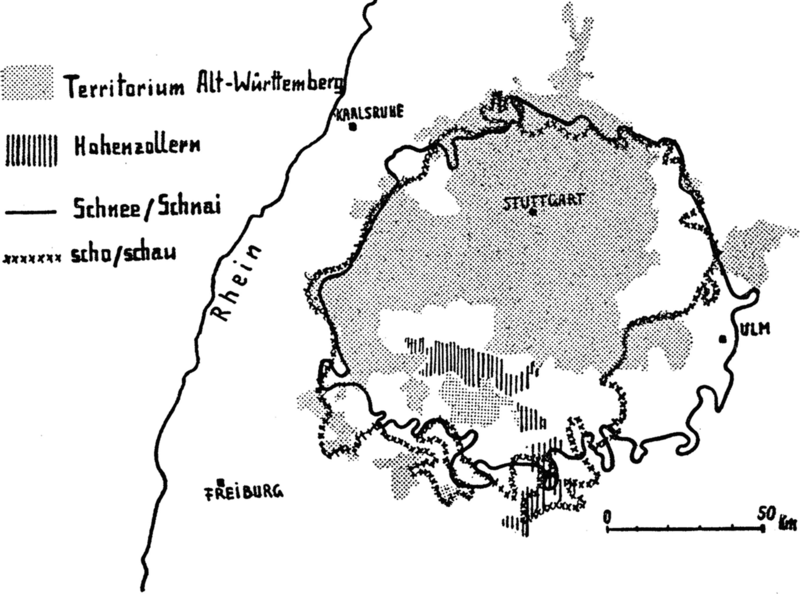 Using a cartographical representation, Maurer (1942: Map 48) relates dialect variants of the southwestern part of Germany to the historical territories in this region (Fig. 1). While there is an almost complete coincidence in the dialect borders with the historical territories in the western part of the map, there is nothing similar in the eastern part. Thus, in the sense of Coseriu, there is a partial coincidence in the linguistic and historical structures. In addition, other studies reveal further nonlinguistic phenomena which (partially) coincide with the linguistic or territorial patterns. Among them are the confessional boundaries, which from the early modern times until the twentieth century often coincided with the historical territories of southern Germany, too. As, at the same time, confessional boundaries typically are boundaries of marriage, it becomes clear that the consolidation of “spaces” is determined to a considerable degree by synchronized acts in various fields of social life. It is, to express it in a more modern style, “through the practice of routines, over time and on a mass scale, at the level of both individual and institutions, that ‘places’ and ‘regions’ emerge” (Britain 2010, p. 79); emphasis in the original). As indicated, these routines only concern a part of the culturally conditioned or identity-forming spectrum of human action, so that an absolute equation of language and all other phenomena of social or cultural actions are doomed to failure. However, most work in dialectology to date is focused only on the description and analysis of language structure and language systems. This is a methodologically derived simplification which runs the risk of neglecting the speaker and the communities of speakers as acting people. In this respect, Auer (2013, p. 5) calls for empirical studies and theories “that bring back the speaker as a major factor in geolinguistic variation.” Auer’s perspective enters the context of recent sociolinguistics, which defines a third wave of variation studies (Eckert 2012). Linguistic homogeneity at the place, as it was often constructed in dialectology, gives way here to a concept of dynamic heterogeneity. In studies of this branch of research, it is typically assumed that speakers assign different social meanings to individual language variants depending on the particular context. For individual linguistic signs, indexical fields are assumed (Eckert 2008), which, depending on the situational requirement, follow functionally determined and ideologically partly different oriented mechanisms of order (for the concept of “indexical order,” see Silverstein 2003). Linguistic variation constitutes from this point of view, “a social semiotic system capable of expressing the full range of a community’s social concerns. And as these concerns continually change, variables cannot be consensual markers of fixed meanings; on the contrary, their central property must be indexical mutability” (Eckert 2012, p. 94). While, for example, sociolinguistics under the influence of the early Labovian work attributes language mainly to social factors, it also implies a categorical fit or static conditionality. More recent studies emphasize people’s options for action, leading to a more dynamic conception of language variation and change. For example, Glauninger (2012) describes the complexity of such processes under the consideration of both the object-level (i.e., the language itself) and the meta-level (i.e., speaking about language) with the concept of meta-sociosemiosis. This means a process of sign production taking place in a concrete speech community. The produced sign is used to refer to speakers of other speech communities. The challenge for language geography in the future will be to connect such semiotic approaches with linguistic and nonlinguistic practices of geographically identifiable social groups in order to reconcile “the spatial [...] as a dimension of action” (Werlen 2008, p. 279, my translation). Lameli (2015) highlights some implications of such a functional approach, using the example of a salient linguistic phenomenon, the compensation of /r/ by /l/ (so called lambdazism) in central Germany which can only be adequately explained by the nonlinguistic behavior of in-group members. A theoretical framework which is dedicated to the interaction of linguistic spaces, community, and action is thus applied in a broad linguistic way. According to Eckert (2012, p. 97f. ), it has to treat “speakers not as passive and stable carriers of dialect, but as stylistic agents.” In conjunction with this thinking, the question of social and cultural self-location should also be discussed, as this is an essential source of the individual design of action (see Schütz and Luckmann 1984). Even if there are a considerable number of approaches, a comprehensive theory has not been worked out so far. For the moment, therefore, much has already been gained, if one looks at some important empirical results. In the following, German dialectology is used as a model case, standing as the pinnacle of probably the most intensive debate addressing the connection of linguistic and nonlinguistic phenomena. Looking at the development of this tradition, it is well positioned to exemplify different views on language in those sociocultural relations, which are not only relevant from a historical perspective but also from a contemporary one. An awareness of the social dimension of dialects is as old as dialectology itself. Already in 1821, the Bavarian linguist Schmeller differentiates between a common rural pronunciation and the speech of the bourgeois class in the cities and the pronunciation of the educated in his grammar on Bavarian dialects (Schmeller 1821, p. 21). This synchronic description stands in contrast to the question of dialect change, shifting the focus from the social to the cultural dimension. For much of the nineteenth century, the assumption of dialects as the historical continuants of the Germanic tribal languages is almost dogmatically prominent. In this view, the borders of dialect regions are seen as the borders of Germanic tribes. But as soon as larger data collections become available, a new perspective arises. In his study on Swabian dialects, Fischer (1895, p. 84) concludes that in many regions, the borders of the postmedieval duchies, dioceses and confessions coincide with the language borders. In particular, the political borders reveal striking coincidences with the distribution of dialect variants. For Fischer (1895, p. 87), the cohesiveness of the regions can “only derive from the traffic-inhibiting effect of such political boundaries.” In the case that two neighboring regions differ in linguistic terms, “traffic across the border was too small to allow the given model to go beyond to have an influence on the other side” (Fischer 1895, p. 84). Haag (1900, p. 140) also realizes that “nearly all language boundaries [...] coincide with political traffic barriers, old ones and new ones” (my translation). Therefore, for Haag, too, it is the territories which stimulate the evolution of language areas and, in the further course, guarantee the stabilization of these areas over a period of nearly 300 years. This approach developed into a productive research focus in German dialectology during the first half of the twentieth century. The respective studies have found their way into reference books under the etiquettes of the “extralinguistic method,” “cultural-space research,” (Kulturraumforschung) or “cultural morphology” (Kulturmorphologie), and they received a significant boost by the often interdisciplinary work of Frings (see Aubin et al. 1926). The basic idea behind these studies is to make history, that is, a regional history, usable as a means of explaining the variation, change, and stability of regional varieties. Against this background, the factors of language change are set in nonlinguistic ways, be it in the social contact between the German tribes and Romans in the Rhine region or the mixtures of medieval settler streams in eastern Germany. In contrast, linguistic stability is seen as a connection with territories, which, the aforementioned relevance of traffic aside, entails its own administrative structures, legal formations, and much more. As a whole, the argumentation in this phase is based on the macrolevel, where speech communities are defined in concrete nonlinguistic contexts (e.g., marriage). For some authors, in an almost positivistic sense, any speech community is the expression of nonlinguistic effects and processes of language history. Seen this way, human beings live within their prescribed limits, among which boundaries represent one of several manifestations of human existence. Needless to say, this definition leads to an overemphasis of the concept of borders. With this statement, Bach already strikes the tone of a modern social geographer. From this perspective, people’s actions are due to those abstractions which are passed down through generations. Bach thus identifies the relevance of mental representations that have a retroactive effect on all expressions of social and cultural practices including language. At the same time, he overcomes the somewhat too schematic dependency of language borders on traffic areas, which had long been regarded as primarily decisive, by reevaluating “traffic” in a “socio-psychological” (“sozialpsychologisch,” Bach 1950, p. 65) manner and linking it to the experiences and evaluations of the language partners. However, this definition remains without a larger response. On the contrary, from the current perspective, Bach’s statement sounds like the concluding remark of the culturally oriented approach which has subsequently disappeared from the scene to some extent. Due to the limited coincidences of the very different phenomena, the process of referring language to the cultural practices of human beings could only be successful if it led to a routine of atomistic comparison. This point was reached when the atlas of German folklore (Atlas der deutschen Volkskunde; ADV), inspired and promoted by linguists among others, aimed to prove the spatial comparability of social practices. However, when the ADV appeared in the late 1930s, disillusionment and even disappointment arose in view of the absence of the anticipated extensive coincidences (see Cox and Zender 1998, p. 169). Similar to Maurer’s map, there are only partial coincidences of particular phenomena in particular regions, thus making it difficult on the aggregate level to identify clear-cut regional patterns of cultural coherence between language and, for example, traditions of agriculture, medicine, marriage rituals, eating habits, costumes, religious practice, or popular beliefs. An overall pattern that enables a well-defined overall spatial classification is simply not identifiable. The subsequent neglect of this branch of research was accelerated by the fact that culturally oriented studies were exploited beyond the narrower disciplinary boundaries in a nationalist discussion between the 1920s and 1950s (see Knobloch 2010). Thus, in the twentieth century, other topics, above all those of the language-systematic nature, were able to gain the upper hand. Today, however, it is accepted that the early approaches have certainly identified an important core. Thus, in his dialectometric work on Bavarian-Swabia, Pickl (2013) undertakes a statistical examination of prominent linguistic factors on a lexical scale. His study confirms the results found in traditional dialectology: rivers only exceptionally influence the borders of linguistic areas, while political borders influence them significantly if they coincide with ancient territorial borders. After all, this provides statistical evidence, at least for a subarea of the German-speaking world, that the basic assumptions formulated around 1900 apply. This result is important because, in contrast to previous work, it was not achieved on the basis of the evaluation of individual isoglosses but in an intersubjective analysis of local mass data. Against this background, it is not really surprising that the sociocultural approach in the publication of the German atlases continues to this day. It is common practice, as Fischer (1895) already had undertaken, to offer historical interpretation aids in modern dialect atlases. In addition, there is information on more recent nonlinguistic practices. The Linguistic Atlas of the Central Rhine Area (Mittelrheinischer Sprachatlas; Bellmann et al. 1994–2002) provides an example with a map on commuter flows, offering information about an important aspect of social dynamics in the area in question. The Linguistic Atlas of Bavarian-Swabia (Sprachatlas von Bayerisch-Schwaben; König and Wellmann 1996–2009) also provides nonlinguistic information. This atlas focuses on the everyday behavior of the atlas informants by offering information on, for example, where the informants go when they say they are going to town among other things. Such information serves the interest for nonlinguistic explanations for linguistic stability on the one hand and for recent linguistic changes on the other (for a non-German example, see the Atlas of North American English; Labov et al. 2006). It also documents a changed scientific perspective on sociocultural conditions by taking the speaker-centered microperspective in addition to the more distanced macroperspective. The sometimes schematic view on the language area thus gives way to an integrative analysis of speech communities, which takes cultural imprints into account as well as specific actions of the speakers. Against this background, the linguistic divergence is to be understood as a cognitive aftereffect of the historical formation of national borders. As a result, the linguistic reference point for the language partners in the region is no longer the regional language systems (dialects) but the superposed standard languages in Germany and France. The consequence of this cognitive reorientation, which essentially represents a reassessment of geographically distributed communities as speech communities, is a new formation of the language area along the political border. In this way, language geography, speech communities, and speech acts are closely linked. The above example of the FLARS project was chosen because it illustrates the interaction of nonlinguistic conditions, mental representations, and linguistic acts in a speech community that differentiates itself based on these factors. In addition, this chapter now presents two more comprehensive analyses which are particularly well-suited to illustrate both the relevance and the scope of the interaction of language areas, speech communities, and nonlinguistic parameters of action. The first example is dedicated to the connections between speech communities and political acts. It focuses on a linguistic boundary which will be discussed with reference to nonlinguistic facts. Even though this chapter is dedicated to the German tradition, the linguistic situation in the USA is introduced in more detail, as this is where the most comprehensive analysis of this kind has been conducted. Essentially, the example cited above on the connection between speech communities and territories can be continued in a different context. Against this background, the USA example serves as further evidence on a linguistic scale. The second example looks at more recent developments in Germany on a broader scale. It takes as its starting point the interrelationships between speech communities and economic acts. In the third volume of the Principles of Linguistic Change, Labov (2010, pp. 208–235) raises the question of the historical and social conditions under which language exists and language change takes place (see also Labov 2012). Labov focuses on the so-called North/Midland border, which is in the eastern part of the USA where historically the settlers began their trek west. Linguistically, this border represents a particularly stable boundary, especially in terms of lexical, but also phonological contrasts. A peculiarity arises from the fact that the northern system of short vowels is currently undergoing a language change against standard American. According to Labov (2010, 2012), this Northern Cities Shift not only strengthens the linguistic coherence of the north but also intensifies the existing social differentiation between the north and the Middle/South region, which can be traced back to the beginning of the nineteenth century. In the manner of the abovementioned extralinguistic method, Labov demonstrates, for example, north-south differences in the techniques of house building and woodworking, which are in line with the linguistic border. He argues that the transportation routes of this region were laid out in an east-west direction and that a north-south route connecting the two regions was missing for a long time. As a consequence, linguistic leveling processes were more likely to occur along the latitude than along the longitude. At the same time, the social demarcation of the northern and southern communities, the Yankees and the Southerners, has increased. This is another finding that could be placed within the sociolinguistic paradigm (cf. also the northern and southern opponents in the Civil War). So far, Labov is on the traditional dialectological terrain. He leaves this field with an analysis that relates the linguistic differences to concrete attitudes and practices. First, Labov (2010: 219 et seq.) refers to a differentiation in political attitudes in which a clear spatial separation could be proven. Strikingly, the core areas of two groups, the so-called moralists and individualists, sort themselves out precisely along the North/Midland border: the northern group increasingly focuses the state’s duty of care and sees the main task for the state in securing a good life for people; the southern group, on the other hand, tends towards an utilitarian view according to which the state should not interfere too strongly in the private interests of the individual. In line with this are, second, differences in the USA presidential elections in 2004. A regression analysis shows that, in addition to the size of the cities, dialect area membership is a significant variable in explaining electoral behavior, doing so better than the classification according to federal states (Labov 2010, p. 224). According to this reasoning, there is a clear preference for the Democratic candidate in the northern dialect area. According to Labov (2010), the effect is similar for the year 2000 but is weakened for 2008. What is most striking is the fact that examining voting behavior concerns not only attitudes but also real decisions. Taking a closer look at the states in which the death penalty is or is not implemented reveals an indication that this behavior has historically evolved. Once again, it is the states of the northern dialect area where the liberal thinking, in this case the rejection of the death penalty, has been opposed since the middle of the nineteenth century. At the same time, a different attitude to slavery (north – against) and religious conservatism (south – pro) is reflected in the two regions. Labov makes another remarkable finding concerning the electoral behavior of the Americans, taking a look at the vote on the American Civil Rights Act of 1964, which did fundamentally strengthen the rights of African Americans. By separating the votes of the House of Representatives according to their origin, Labov (2010, p. 234) demonstrates that it is not primarily party membership that explains the electoral behavior (Democrats vs. Republicans) but rather membership to the southern or the northern dialect area. The dialect distribution thus better reflects electoral behavior than the actual party affiliation. As long as these ideological differences persist, speakers may be more likely to align their productions towards those around them who share their own identity and world-view. And along the linguistic and cultural border, they may be less likely to accommodate to others whom they perceive as holding different or hostile views. In this line of thinking, Labov takes up a typical “in-group/out-group” scheme, which explains a multitude of social actions. It is also clear that the individually addressed nonlinguistic social conditions or actions have no causal explanatory power for the linguistic phenomenon. Rather, they are intersecting phenomena that follow a specific spatial order. Methodologically, this reasoning makes it clear that in addition to the local factors commonly analyzed in sociolinguistic studies, such factors which have a greater historical depth and are more global in scope must also be taken into account. In a sense, Labov, as a sociolinguist from the very beginning, has returned to the roots of dialectology. At the same time, however, he goes beyond it by locating the ideological content in the language itself and thus placing the speaking individual at the center. In so doing, the semiotic value of language, which is an important part of the self-preserving power of what one might call the social system, comes to the fore. According to the above statements, it is not surprising that connections such as those made by Labov in the political realm can also be observed in other dimensions of human existence. Particularly in economics, several studies which deal with the connections between language and economic factors have been presented in recent years (“The Economics of Linguistic Diversity” in terms of Ginsburgh and Weber 2011). The assumption of such a connection is justified when both language and economic action form communicative systems in the broader sense. For language, this certainly does not have to be specifically emphasized. However, the communication-theoretical foundation of economic behavior requires a more detailed elaboration. In the simplest case, economic action can be described as a stimulus-response model: someone offers something, another accepts it or not. On an extended level, a strategic moment could be incorporated into such a model: someone is thinking about what to do to get someone else to accept the offer while the other is thinking about what the offer is for. Based on similar considerations, Akerlof and Kranton (2000) have developed a model that identifies identity – understood here as “a person’s sense of self” (Akerlof and Kranton 2000, p. 715) – as a central factor in the economic behavior of all actors involved in an interaction. This reasoning can be directly linked to the above considerations. The relevant studies examine the question whether language supports economic exchange. It is striking that for a long time only linguistic relations between nations were considered in this context. To demonstrate the significance of this work, a meta-analysis by Egger and Lassmann (2012) can be discussed. The authors evaluate 81 scientific papers in which a total of 701 languages were examined for their influence on international trade flows. The result is clear: if the trading partners’ countries share the same language (official language or spoken variety in a multilingual context), the trade volume increases by an average of 44%. A series of related publications, on the other hand, goes one step further, systematically linking economic activities in the Federal Republic of Germany with the spatial distribution of historical dialects. Here, dialects serve as a proxy for cultural identity. The underlying idea is that if it is possible to prove the influence of language on economic activity, it can be assumed that, due to the strong cultural impact of dialects, this influence should also be culturally based. In a first study, Falck et al. (2012, first published in 2010) analyze the cross-regional migration flows in Germany. The authors analyze all internal moves of the years 2002–2006 on the level of the German NUTS-3 regions. The basic assumption is that each person attaches a specific value to the region in which they are a resident. This value can be determined by two factors: (1) the economic quality of the region (e.g., salary structures, employment rate, and price level) and (2) the subjective relation to the region (e.g., sense of home, cultural identity, social acceptance). In so doing, an economic factor is contrasted with a more emotional one. It is also assumed that the two factors influence each other. Based on this finding, a gravity model is set up in which both factors are taken into account. Migration is understood as a function of the sum of the specific economic characteristics in the source and target districts added around the pecuniary and emotional costs of a move. While the economic characteristics are operationalized via district-specific parameters, the pecuniary costs are measured via the geographical distance and the travel time between the districts. Dialect similarities (Lameli 2013) between the districts are chosen as a means of approaching the emotional costs. The assumption is not that people will choose their relocation according to the dialects but rather that the dialect regions can be taken as a proxy for regions of cultural similarity. In addition, numerous other factors were considered in separate analyses, which could potentially serve as another proxy for cultural similarities or could have a further influence on the relocation behavior (e.g., historical territories, degrees of urbanity, industrial structure, religious boundaries, political borders, FRG vs. GDR, soil quality, height differences, age, and gender). intangible cultural borders […] that impede economic exchange. These intangible borders […] are enormously persistent over time; they have been developed over centuries, and so they are likely to be there also tomorrow. This result is important as it demonstrates a significant connection between dialects and nonlinguistic action in a mass analysis for the first time. Further results were achieved in some follow-up studies. It is well known, for example, that well-educated people who are willing to take risks tend to move over long distances (Jaeger et al. 2010). In an evaluation of 994 persons, whose social, economic, and behavioral data are collected via the so-called Socio-Economic Panel (SOEP, cf. Wagner et al. 2007). Bauernschuster et al. (2014) find that exactly these persons significantly often exceed the cultural areas indicated by the dialect data. All in all, the dialect data explain this migration pattern statistically much better than, for example, the geographical distance. As these two studies show, mobility is highly associated with a preference for cultural familiarity. Special incentives, such as higher education, are needed to overcome this (see also Falck et al. 2018). While these studies start in the private sector, another study explicitly focuses on the business sector. Lameli et al. (2015) analyze the influence of dialect similarity on trade. The study is based on trade flows from 24 groups of goods between 1995 and 2004 in 101 German transport districts (>4 million observations). Here, too, the similarity in dialect has a significant influence but is individually considered weaker than the factor “travel time.” Using the example of the Augsburg transport district, the authors illustrate this connection (Fig. 2). Augsburg is located in the south of Germany where two major dialect groups exist, the Alemannic group which is mainly located in the federal state of Baden-Württemberg and the Bavarian group which is mainly located in the federal state of Bavaria. Augsburg is special in that it belongs to the Alemannic (more precisely to the Swabian) linguistically, while it lies politically in Bavaria. The authors find that Augsburg shows a significantly increased trade volume only in Swabia (i.e., Baden-Württemberg), not in Bavaria. This corresponds almost perfectly with the linguistic similarities found in Augsburg. A more recent study (Seitz et al. 2017), which focuses on strictly financial-oriented action, shows similar results with regard to the risk behavior of German banks. Here, too, there is a significant coincidence with dialect similarity, which cannot be explained by any other factor. In the question of how high they set their risk deposits, the decision-makers obviously orient themselves on the behavior of other banks and in turn prefer those that are located in a dialect region as similar as possible. What can be seen here is a special trust in the decision-makers of one’s own cultural area – mirrored by the language area – which is once again significant in-group behavior. The examples could be easily extended. However, it has already become clear that actions are first dependent on individual conditions, that is, biography, attitudes, etc. Second, people’s actions have cultural imprints which go much further than what is generally assumed. In particular, this is illustrated by economic behavior. These connections do not, however, speak in favor of a positivist cultural imprint but rather illustrate the dynamic coexistence of linguistic and nonlinguistic actions. As it turns out, people – whether consciously or unconsciously – do weigh rational and emotional aspects and bring them into subjective harmony, as, for example, in the case of trust in the banking sector. As becomes also clear on closer examination of the microlevel, language is even an extraordinarily important decision-making factor (seen, for example, in the Heblich et al. 2015 laboratory study). In a significant number of cases, the individual construction of one’s own community (in-group), which is usually associated with increased trust, influences both the linguistic and nonlinguistic behavior of the individual. This chapter outlines the speech community as a community of aligned acting. It has been demonstrated that, surprisingly frequently, people from the same community make similar decisions from a multitude of linguistically and nonlinguistically relevant options for action. Furthermore, it becomes obvious that this social behavior is also relevant from a geographic perspective. Luckmann’s theory can be referred to as a conclusion. For Luckmann (1992, p. 5; my translation), the “area of action [....] is surrounded by a social ‘fence’” which is “designed by the individual (by one’s will, interests and knowledge).” The studies mentioned above have indicated that, in order to remain in the picture, the fence can be overcome but still provides a favorable point of orientation. This is why there are coincidences of linguistic and nonlinguistic phenomena in some regions and differences in others. The most relevant motor of both change and stability is the identity related or culturally related mental constructions of the people in the regions. In this regard, the example of the Franco-German border region reveals a fundamental change of linguistic geography based on realigned abstractions. Consequently, the fundamental freedom of action implies possible changes of the existing social relations from the outset. From this perspective, the correlations between political and linguistic action are remarkable, since they illustrate, considering the comparatively recent history of the USA, the short time period in which social identities can consolidate into diachronic cultural identities. What Eckert (2012) defines as linguistic variation, namely being a semiotic system that is capable of expressing the social concerns of a community, applies, in this regard, to all the social variation phenomena mentioned above. If at the beginning of this chapter reference was made to the possibility of locating people on the basis of their language, it can, therefore, also be assumed for other courses of social action, at least to a certain extent. Even though this chapter mainly focuses on the German tradition, the example dedicated to the political scene in the USA indicates crosslinguistic analogies. As it also became clear, dialectology is very open to these connections already in its early phase, but is, in Germany, sometimes too strongly bound to the concepts of space and border (see Gauchat 1903 for a very different discussion in France). The extent of the interdependencies can only be captured by taking into account the cognitively reasoning and socially acting individual. This, in turn, would lead to a sharpening of the connections between language geography, community, and action. It would, therefore, be highly desirable if linguistics were to become even more open to interdisciplinary approaches in the future as well as if other disciplines were to become more open to linguistics. Auer, P. (2013). 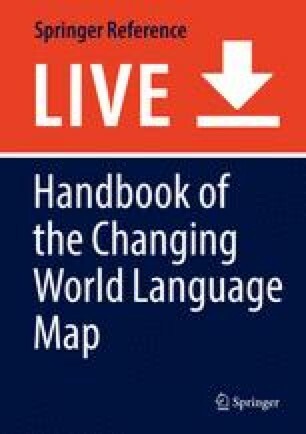 The geography of language: Steps towards a new approach. Freiburger Arbeitspapiere zur Germanistischen Linguistik, 16. http://portal.unifreiburg.de/sdd/fragl/2013. Accessed 30 June 2018. Seitz, B. C., Rathgeber, A., Lameli, A, Gaugler, T. (2017). Sharing more than dialects: Herding behavior in bank risk-taking explained by cultural vicinity. https://papers.ssrn.com/sol3/papers.cfm?abstract_id=2909878. Accessed 30 June 2018.